Nobody will say for certain what Max Holloway weighed when he agreed to fight Khabib Nurmagomedov at UFC 223, but he has until Friday afternoon to get down to 155 pounds if he wants a shot at the UFC lightweight title. That’s 10 pounds heavier than his typical fighting weight, though he’s a big featherweight and it typically takes a months-long training camp to adequately get in shape for a fight then prepare the body to make weight. Holloway got the call on April 1 and his weigh-in is April 6. How will he ever make it in time? Holloway’s nutritionist George Lockhart has spoken to several outlets over the last few days, and from everything he’s said, it sounds like Holloway is in for a genuinely torturous week. Lockhart told the Bloody Elbow that Holloway’s weight cut is equal to the biggest he’s ever presided over. In 2016, he helped Bellator vet Brian Rogers drop 26 pounds in five days, which means that Holloway was walking around carrying at least 181 pounds a week before his fight. Dropping that much weight that fast is not only incredibly difficult, but also dangerous. Middleweight Uriah Hall suffered a “slight heart attack” as he was cutting weight earlier this year. This is rare — I want people to know that — but he’s going to be an extreme ‘keto state.’ We need him to burn as much fat as humanly possible. Whereas every other fighter we’re working with this week at UFC 223 has already lost the fat, coming in shredded and just needing to cut water, Max has to be in a state where he’s burning fat. He’s going to be running a few hours this week. And some people who run marathons or condition a lot might say that’s not a lot, but when you’re depleting your body and asking it to do more, that’s the challenge. Typically, we fuel fighters up to give their body what they need. If I say, ‘Hey, we need you to go on a run,’ we’ll fuel the body up for it, so the body wants to do it. What I told Max is, ‘I’m going to be asking you to do things your body is not going to want to do.’ And that’s when it becomes a mental thing. That sounds ... unhealthy! Dropping that quantity of fat and water in under a week is hard enough, but then getting in the octagon with the most feared lightweight on the planet is whole other kettle of fish. Khabib told Ariel Helwani that he wouldn’t have taken the fight if he were in Holloway’s position. Holloway is in Brooklyn now, hitting the treadmill alongside Khabib in an attempt to lose every ounce he can. 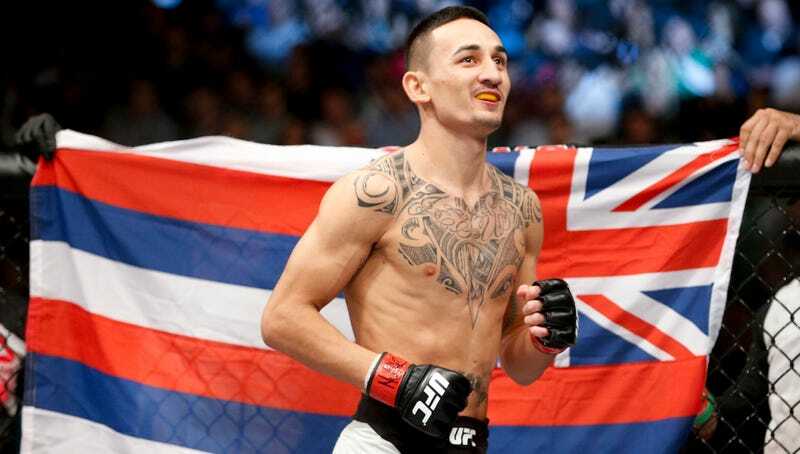 If the fight were taking place in California, Holloway wouldn’t be cleared to fight, since he’s already at least 16.7 percent above his fighting weight. As it stands, he’s got a hell of a job in front of him, and given the extreme health risks of acute dehydration, fans might even want to hope for a catchweight bout this weekend.